2/28/2019 – some patches of snow in the shaded areas and very, very wet and muddy ground. one upper section just below the Flaming Gorge Dam all the way down past 'Little Hole' and to 'Dutch John', and one lower section down to the confluence with the Colorado River. 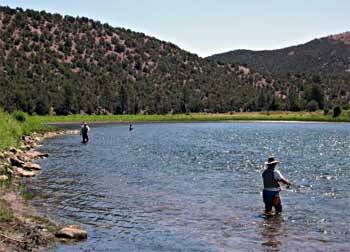 The upper section is one of the nation's most famous 'Blue Ribbon' trout waters, while the lower section has excellent Channel Catfish fishing. The lower section is also home to several endangered species, which has led the U.S. Fish and Wildlife Service to gillnet and electroshock and kill many predators such as catfish and pike.